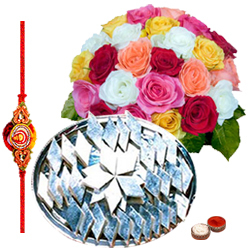 Dedicate your prayers for the good fortune of your dear ones and deck it in the presence of this Attractive Rakhi with Gifts complemented with a free Rakhi, Roli Tilak and Chawal on Raksha Bandhan. This Gift consists of 1 Kg. Kaju Katli from Haldiram and 24 Mixed Roses Bouquet with Free Rakhi.